where is the log-likelihood contribution of the ith observation that has weight , and is the value of the frequency variable. For the determination of and , see the WEIGHT and FREQ statements. 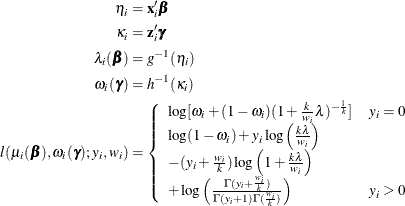 The individual log-likelihood contributions for the various distributions are as follows. where g is the link function. where h is one of the following link functions that are associated with binary data: complementary log-log, log-log, logit, or probit. These link functions are also shown in Table 7.9. You can control which binary outcome in your data is modeled as the event by specifying the response-options in the MODEL statement, and you can choose the link function by specifying the LINK= option in the MODEL statement. where and are the values of the events and trials of the ith observation, respectively. measures the probability of events (successes) in the underlying Bernoulli distribution whose aggregate follows the binomial distribution. For the gamma distribution, is the estimated dispersion parameter that is displayed in the output. where is the dispersion parameter. and the constraint is satisfied by modeling categories. In models that have ordered response categories, the probabilities are expressed in cumulative form, so that the last category is redundant. In generalized logit models (multinomial models that have unordered categories), one category is chosen as the reference category and the linear predictor in the reference category is set to 0.
where k is the negative binomial dispersion parameter that is displayed in the output. and is the Tweedie probability distribution, which is described in the section Tweedie Distribution. Evaluation of the Tweedie log-likelihood for model fitting is performed numerically as described in Dunn and Smyth (2005, 2008). where . This EQL is used in computing initial values for the iterative maximization of the Tweedie log likelihood, as specified using the OPTMETHOD= Tweedie option in Table 7.5. If you specify the OPTMETHOD=EQL Tweedie-optimization-option in Table 7.5, then the parameter estimates are computed by using the EQL instead of the log likelihood. where k is the zero-inflated negative binomial dispersion parameter that is displayed in the output.